Honor’s Knight is the second in Rachel Bach’s ‘Paradox’ series. The narrative follows the delightfully named Devi Morris, a powered-armour user, as, put simply, she jaunts around the galaxy, usually on the run from somebody, and proceeds to eliminate everything around her with extreme prejudice. This second book picks up from the conclusion of the first, and immediately establishes credentials by not ducking any consequences. Devi is emotionally wrung out, hurt, confused, and particularly good at suffering in silence. Readers of the first volume will be left as torn apart as Devi; the first third of the book is really one long emotional crisis, and it reads very well. Bach has a knack for clear, concise, easy to read prose. Like her heroine, the text is blunt, stylistically straightforward, but packs a serious punch. It was very easy to find myself turning pages, and looking up an hour later wondering where all the time had got to! The characters are largely familiar from the first volume; outside of Devi, and one of the new characters whom I won’t spoil here, they don’t really have the sort of depth that I’d like. This may be a function of the first person narrative more than anything else, but most of the cast remain relative ciphers. They do have some backstory, usually provided in dialogue with Devi, but it was a struggle to really see most of them as more than foils for the heroine. There are a few exceptions of course – Caldswell, the captain from the first novel, draws attention from the first page; Bach gives a nuanced portrayal of a tormented, angry man, and manages to keep a large part of this subtextual, insinuating itself into the reader’s experience via incidentals, rather than explicitly infodumping in the prose. There’s also the central romance, between Devi and the cook from the previous novel (Rupert); this suffers rather from the consequences of the first novel, and the impact of those consequences is wonderfully written. That said, the whole romance angle reads a bit more awkwardly than I’d hoped – it’s just not as interesting to read as the various plots, machinations, hostage situations, gunfights and witty dialogue in the rest of the book. The ripples that come out of the relationship are wonderful, the impacts on the narrative are fantastic, it just didn’t quite ring true for me. Plot-wise, this one is an absolute barnstormer. The original book, Fortune’s Pawn, was a fast-paced action piece. 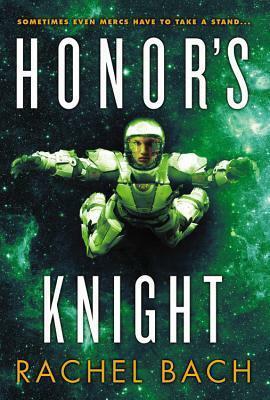 Honor’s Knight keeps that pace, and the rapid-fire action, and intertwines it with some serious twists and turns – crosses, double crosses, justifications and lies mixed up with gunfire, quick escapes, and last minute salvation. Overall then, if you’ve read the first book in the series, you really will want to follow up to see where this one is going. The series has a lot of promise, and it’s delivering. Been powering through Rachel Bach's 'Honors Knight' the last few days. Strong female protagonist, mildly awkward romance elements, shape changing, moral ambiguity, aliens - it doesn't have it all, but it has a lot of good stuff. K.J. Parker is an author whose prose I’ve always enjoyed; on the other hand, nobody else ever seems to have read any of their work, and that is, frankly, a crime. As such, today we’re going to talk about Parker’s short fiction anthology, ‘Academic Exercises’ – which doesn’t require any knowledge of existing series to read through, and is, not to give the game away, really rather good. The text collects a variety of Parker’s short fiction; some of it has been available before in the form of novella (e.g. ‘Purple and Black’, an epistolary tale of ambition, power and trust), and some of it has even been made available for free in the publisher’s ongoing magazine (the marvellous ‘Let Maps to Others’, discussing the value and necessity of document authenticity, in a thick stew of revenge). There’s also a set of work I hadn’t seen before, which may well mean it’s new – it’s certainly new to me. So, what makes this anthology worth reading? Immediately, two things: first, the quality of Parker’s prose. Each story is written in the first person, and each inner monologue is presented with their own voice – across all the different stories, the narrators are easily distinguishable from each other, which is quite an achievement. Tonally, the narrators are quite similar – there’s a dry, grim, resigned wit that permeates Parker’s work, and whilst it’s rarely laugh-out-loud funny, it’s often amusing. At the same time, the words themselves are a pleasure to read – well crafted, with excellent description of both worlds and ancillary characters. The latter are perhaps not as well drawn as the main characters – but that may be a factor of the first person narrative form. So, the first reason to read Parker’s work is that the setting is well drawn, the characters feel like people, and the whole is both cohesive and a pleasure to read. Parker unflinchingly approaches larger themes through their characters, and unrelentingly pursues all sorts of complex aspects of the human experience. The stories aren’t afraid to talk about history, for example –a bout what makes a thing authentic, and what makes people that way too. It doesn’t shy away from philosophy, and several of the narratives explore the strands of thought around the question of whether the motivation for actions matters, or merely the result. Alongside these broader themes there are characters who are very clever indeed, and use that cleverness to drive their own actions – in many cases, dragging the reader after them kicking and screaming. By no means does “intelligent” equate with ‘nice’. Within these characters, the author throws in a lot fo the deeper human emotions – fear, loss, pride, revenge, and drills into their often catastrophic effect on the human condition. Each protagonist is convincingly portrayed, and the end result is that I, for one, couldn’t stop turning pages. Parker is also a wonderful writer of the twist denouement; this is less obvious in their other work, but most, if not all of the short stories presented here have at least one sting in the tail. This is perhaps an issue, in the context of reading the entire collection back-to-back; I started looking for plot twists, even expecting them, rather than just letting them surprise me – but that’s not a fault of the stories themselves, so much as an observance of a common theme in the author’s work. There’s a few non-fiction articles thrown in here for good measure, on the rise and development of weapons and armour – and these are written in the same accessible style, and quite entertaining. It would be nice to see the references used for these, but in context, they’re still very interesting. At any rate, at the close of the book, I’d say K.J. Parker is writing some of the smartest, sharpest, most well observed prose available in the genre today – and that this collection would serve as a good intro to their style and body of work, if you wanted to dip your toe in the water. Note: The collection is currently available electronically as part of the Humble Books Bundle, which is where I got my copy; it’s been quite hard to get hold of in paper form, so this might be a good time to pick up the e-copy, if you’re interested. Been powering through K.J. Parker's short story collection, Academic Exercises, over the last few days, having picked it up as part of the latest Humble Books Bundle. It's all vintage Parker, really; big philosophical and moral themes, wrapped up in characters full of selfishness, vengeance, petty crime, and the odd moment of goodness. I've always said Parker is one of the most criminally under-read authors currently in the field, and going through this text only confirms that impression. In summary: It's SO GOOD. 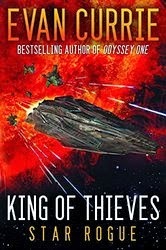 King of Thieves is a finely done piece of military science fiction. It’s apparently a stand-alone novel, set in the same universe as a wider series by the same author. Not having read that series, I thought I’d put that to the test. The narrative follows the Captain and crew of a starship, as they set out to investigate various stellar anomalies. One of those turns out to be something rather larger, and everything very quickly goes from bad to worse to downright terrible. This is a very plot driven book, and I don’t want to hand out spoilers, but I will say that after an initially slow burning lead-in, most of the book was pretty much non-stop action, as characters were forced to react quickly to one crisis or another. The central narrative split is between the space-side staff, and a team of Marines and Researchers who are used to investigate interesting and potentially lethal knick-knacks. The characters are a bit thin, their inner dialogue and logic not really given the exploration they deserve (particularly the ship’s Captain), but this is more an action-movie of a book than a character study, and so if we’ve handed over nuanced character development in favour of desperate retreats, heroics and explosions, I can’t complain. Two things make this text stand out – firstly, the writing is more than competent, and makes for a very easy read; the setting is clearly described, and the dialogue flows along smoothly. It might seem obvious, but this does make the text more of a pleasure to read. Secondly, the author has clearly put in some effort to have a consistent scientific framework in their universe, and isn’t shy about providing some technological context to some of the decisions. I couldn’t speak to the accuracy of the science, but it’s nice to feel like everything isn’t happening “because magic tech”, and that the author has thought about how everything in the universe works. From a stand-alone point of view, it’s a good book; there are a few referents to the rest of the series, which I had to roll along with, but nothing that really broke the narrative flow – there was no required knowledge of the rest of the series to enjoy this one. Overall then, a good piece of military sci-fi, with excellent prose, and an impressive amount of science layered over the top. If you enjoy the genre (and probably even if you don’t), this is a good read – sufficiently so that now I’ll be checking out the rest of the series! Review of Evan Currie's sci-fi-military-fiction novel, King of Thieves, to come on Monday. So far it's been a pretty fast paced mix up of Aliens and Larry Niven, which can only be a good thing! 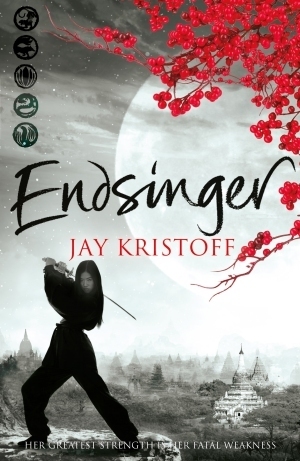 Endsinger is the conclusion to Jay Kristoff’s ‘Lotus War’ trilogy; this takes place in an ersatz feudal Japan, mixed with a steampunk aesthetic and fantasy elements – Samurai in giant armoured suits, with chainsaw-bladed swords, struggle against griffins (or ‘thunder tigers’) which can shatter bones with a cry, and speak in the minds of their riders. It’s not just an adventure series though – it looks at family relationships, the necessity of violence, the cost and means of progress and the price of revenge – all through the lens of a cast of plausible characters, ranging from the sympathetic to the downright diabolical. Given the promise of the narrative, which was very skilfully drawn in the first two books of Kristoff’s trilogy, the question is – does the conclusion deliver? Thankfully the answer is yes – absolutely. The narrative picks up from where the previous book left off – but where that one seemed to extend the narrative of the first, the first few chapters of this instalment throw several different curve balls, leaving the reader shaken and unsure of exactly what’s going to happen next. That this unsteadiness is matched entirely by the reactions of the characters is fantastic, and both the characters and the reader march uncertainly into the narrative together thereafter, the rug swept out from under them. And what a narrative it is. There’s political scheming. Betrayals. Counter betrayals. Love. Stabbing. Friendship. Swordfights. Deaths. Giant war machines. And demons! All of the various narrative threads interweave with each other, and fit together seamlessly as a whole; the pacing is pitch perfect. Each page found something that made me want to read the next one – once picked up, impossible to put down. Given it’s the conclusive part of the trilogy, some farewells are almost to be expected; but really, all of the reveals, the conflicts and resolutions here are incredibly well done. Kristoff managed to pull joy, sorrow, laughter and tears out of me; the absolute rawness of the emotions given out by the characters ripped me open along with them. That portrayal of emotion, and the character relationships that map to it, has always been Kristoff’s greatest strength in this series, and he’s done it again here. So, is it worth reading? Well, if you’ve not read the preceding books, I’d go and do that; the first, Stormdancer, is narrower scoped than this one, but perfectly formed. If you’re up to date on the series though, you owe it to yourself to pick this one up – it will emotionally sucker punch you, and reward you with a heart-wringing narrative, and a marvellous conclusion to an excellent trilogy. Just winding up Jay Kristoff's 'Endsinger', the conclusion of his trilogy of Japanese mythos-steampunk-griffin-female-protagonist madness. It's really, really good so far, and absolutely gut wrenching. Absolutely worth reading. More soon! 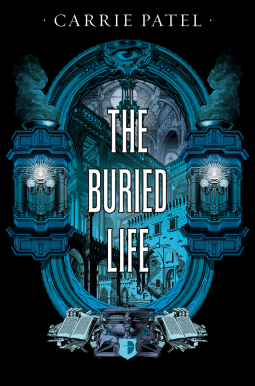 The Buried Life is Carrie Patel’s debut novel – but frankly, it’s good enough that you might not believe that; it begins as a mystery novel, set within an underground city. The text begins following two key narrative strands; one follows an Inspector Malone, part of the city police force, and her new partner, Rafe Sundar, as they begin investigating an unpleasant murder in the city’s high society. The other strand follows Jane, a laundress in the city, whose client list leaves her in a position to act as an undercover informant for the detectives. Whilst the investigation is the framing device for the story, as all good noir tales do, it quickly gets bound up in personal jealousies, politics and secrets. It’s a relative rarity to see a mystery novel mixed with a fantasy setting, and rarer to see it done well. Here, Malone and Sundar’s investigations seem largely logical, their conclusions authentic, and the smattering of complications and red herrings keep the reader in the dark. Mixed in with the classical mystery are some of the classical noir elements – obstructive superiors, withheld information, payoffs, and protagonists who feel more like tarnished knights than heroes – and it’s all to the good. The plot never really lets up – there’s more investigation than gunfights and chases, but it keeps the reader chasing along, trying to figure out what’s going on – and adds enough reveals (and the odd gunfight or chase) to keep things interesting. The characters are perhaps less well defined than they could be; even the leaders of those strands of the narrative are more defined by what they’re doing than who they are. We get a lot of focus on the thoughts of, for example, Malone as she chases along an investigative trail – but why she does this, the motivations, the underlying character, aren’t as well explored; it would have been nice to have had a bit more detail here. Still, what is provided is good work – the characters aren’t caricatures, or cutouts, they just don’t yet feel fully formed – possibly this will change in any later books. The setting, as mentioned above, is an underground city, inferred to have come inot existence after some un-named calamity. It’s slightly claustrophobic, class-ridden, and heavily authoritarian (the government, for example, issues ‘contracts’ providing the detectives with authority to investigate a crime, on a case-by-case basis). The society is largely non-violent, but also feels inherently resistant to change; one of the cleverest premises of the text is that this is at least partially intentional – all pre-calamity texts are under the control of a ‘Bureau of Preservation’, whose members, Historians, control the study and dissemination of knowledge. The remainder of society has an inculcated aversion to ‘unauthorised’ knowledge, and this is very well presented; it also lets the reader think about broader issues around government control of information, the reasons behind historical revisionism and the way in which truth can be shaped and reshaped in the interests of power or in service to a cause; this starts as subtext, but suffice to say that it allows the reader to consider, which is always nice – it’s not just fantasy fiction, the prose demands something of the reader, and it’s all the better for that. Overall, a very well written debut, which stands out in a growing market of dystopian fiction, not just for its mystery, and the quality of its prose, but in its unflinching desire to make the reader think, rather than (appropriately enough), telling them what they should think. Worth the read! Will have a review of Carrie Patel's startling dystopian mystery piece, 'The Buried Life' up tomorrow. In summary: murder, politics, gunfights, intrigue - fantasy noir in a unique setting. Give it a try! 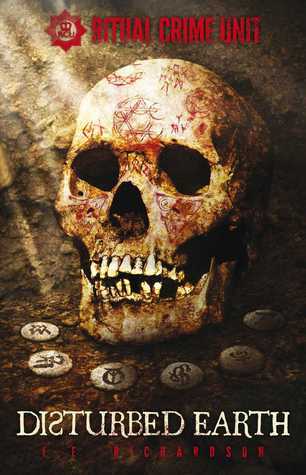 Disturbed Earth is the second in a series of supernatural investigation novels. It feels like there’s not many of that genre set in Britain, and even fewer set outside of London, so it’s nice to see one set in the north of England. The narrative also fully justifies the cliché that “It’s grim up North”. Where other texts in the genre often have a wry, cynical tone to them, this feels a lot like a dark detective drama, which just happens to have a supernatural side. Tonally, it felt a lot like Prime Suspect with demons. The main focus, as traditional in a police procedural novel, is the lead detective of an investigative unit; in this case the under-staffed, under-funded Ritual Crimes Unit, suffering in the aftermath of its last investigation by having even fewer experienced staff than usual. The protagonist, Claire Pierce, is intelligent, cautious, and well defined – the author paints the character’s motivations, feelings and logic with a fine brush. That those motivations are almost invariably pessimistic is, if not expected, certainly in line with the procedural genre. The supporting characters are less well drawn – in particular, a new DS that the protagonist has to deal with seems to be unrelentingly antagonistic for no particular reason. It would have been nice to see a little less conflict and a little more nuance here – on the other hand, it again fits inside the genre convention, so I can’t complain too much. The narrative tracks the protagonist and her team as they work through two seemingly unrelated investigations, pulling in witnesses, amassing evidence, and trying to avoid attention from management oversight. Some of the investigative portions are paced a little slowly for me, but perfectly well written, and the action segments have a pleasingly page-turning quality to them. Overall then, if you like crime novels that have the odd bit of supernatural weirdness in them, this may well be for you; and if you’re a fan of urban fantasy, and are prepared to accept one with a bit more focus on the police than the magic, then you’ll likely find this an excellent read. It’s dark, dramatic, and occasionally funny – and a such, a good read. Should have a review of E.E. Richardson's 'Disturbed Earth' up on Friday; appropriately for Friday the 13th, a dark, grim urban fantasy set in the North of England; it's a quick read, and well worth your time if you have an interest in the genre. The Red Queen is a fascinating story, at least partially defined by its setting. The world it posits is one in which normal people, given the nickname ‘Reds’ act as servants to an aristocracy of ‘Silvers’ , individuals with what are effectively super powers – the ability to throw fire, read minds, cause rapid plant growth, control water, and many others. The division into Reds and Silvers is denoted by the colour of their blood – the Silvers, of course, have silver blood. This gives the world an aristocracy where superiority really is genetically determined, and where no Red can become a Silver. Into this feudalised structure falls the protagonist, a young Red girl called Mare – who discovers that she, somehow, has access to powers of her own. What Aveyard does well is balance various threads of the protagonists personal dilemma’s against each other. Mare quickly becomes involved with the ruling clique of Silvers, forming close relationships with the two adolescent sons of the king; whilst both are interested in her, her own feelings for them are more ambiguous, and Aveyard gives the reader a very nuanced picture of her emotional landscape. This personal layer sits over the top of layers of politics, which are alluded to in dialogue, and partially explained in the narrative. Where there are gaps in knowledge, the readers matches the protagonists, which is an interesting device – and learning along with the protagonist was, in this case, very enjoyable, as the world and the relationships that Aveyard created are gradually teased together. This layer of politics, underneath the more personal relationships, itself is layered over a broader world, one in which the Silvers are at war with other nation-states, and where a growing resentment amongst the Reds is approaching the boiling point of revolution. The latter of these is covered in more detail than the former – Mare, as a Red-turned-Silver is a rallying point for both Reds, who see her as a figurehead, and the Silvers, who see her as a means to placate the Red masses. Where it comes up, the discussion of the revolution, and the place of Reds in society, is carefully played – the social situation is mirrored in Mare’s experiences, and so the reader is given a personal stake in the political situation. It’s also worth noting that there is a historical dimension to this – a few references to ‘the world before’ and ‘bunkers’ suggest that this is a post-cataclysm world, of some sort – these delicate hints are nicely done, and I’d be delighted to ear more about the history and context of this world. The core cast of characters – Mare, her family, the princes, the Silver Queen – are all well drawn. Mare obviously gets the most depth, but the motivations of the two princes, in particular, are drawn out, examined, and given time to grow over the course of the text; the scenes between all three of them are a pleasure to read. The family interactions work well, and serve to remind the reader of the situation outside the Silver bubble at the same time as they remind Mare – it’s just a shame that we didn’t see more of them. The family dynamic is a good one, and it’s nice to read an opening story about a close knit family, rather than the typical orphan-boy-against-the-world; more please! That said, there are some issues here – some of the supporting characters, particularly the more antagonistic Silvers, could have stood to have a bit more character exploration; some of the enmity can be put down to the social context, but it would have been nice to put a bit more depth into some of Mare’s detractors. Still, they work well as they are – it would be nice to see some more of their potential realised in any following books though. To summarise – the setting is carefully, beautifully drawn, and a joy to investigate – I want to know more about how the world got to where it is, and want to see more of it. The characters are believable, and the main players are given enough depth and nuance to make for easy reading, and to make their actions understandable; it would be easy to draw up cardboard cutouts of “Red good, Silver bad”, but the text avoids this, and it gets serious credit for doing so, and going with a more nuanced approach. The story rattles along at a good pace, drawing in the reader; it gives time to breathe where appropriate, interspersed with hectic action that kept me turning pages. Well worth reading, and I’d encourage it – already looking forward to the next book! 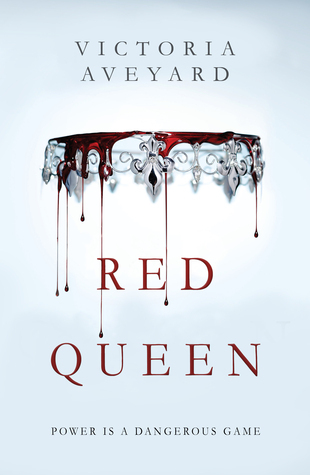 Should have a review of Victoria Aveyard's intriguing YA novel "The Red Queen" tomorrow. There's politics, blood, revolution, super-powers, and a bit of teen romance. Something for everyone - and it's pretty good, too! 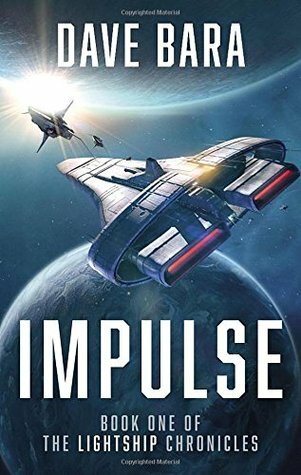 Impulse is the debut sci-fi novel from Dave Bara. It’s protagonist is Peter Cochrane, a ships Lieutenant in a space navy composed of two uneasily allied powers, and a third balancing force, the ‘Librarians’ of Earth. In a nutshell, it’s got a lot of high adventure, the odd firefight, some tense space battles, and some really clever ideas. The background to all the conflict is rather interesting; after a disastrous interstellar civil war, two of the surviving factions have come together in a rather strained compact of alliance, and with the assistance of “The Librarians”, a mysterious group from Earth, have set about rediscovering the remains of the Empire that birthed them, with a combination of peace, enlightenment, and superior firepower. The surviving factions are politically interesting; in one case, seemingly drifting from a more democratic set of institutions toward a monarchy. The whole system has a vibe of The Mote in Gods Eye about it, and that isn’t a bad thing. 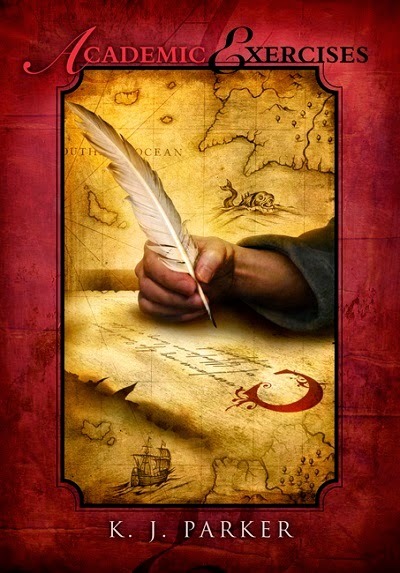 The third faction, the Historians, is another wrinkle for the reader’s attention – serving their own purposes, they advise the crews of the ‘Lightships’, ships which they provided to the growing Alliance, and whose full capabilities only they control. The ideals and agendas of the Librarians are gradually made clearer over the course of the text, and they’re interestingly presented – if not given the space and explanations I would have liked. Hopefully that will change in future books! The descriptions of the ships, and the space battles themselves are well done; the crew feel a bit like submariners, their actions remotely detached from the gross impacts of their actions – again, not a bad thing. We don’t get quite the intricacies of something like Honor Harrington, but it makes for a suspenseful read, and kept my attention admirably. The plot is certainly fast paced, leaping from crisis to crisis, not really giving the reader a chance to pause for breath. This is a shame, in a way, because whilst the text presents a lot of difficult situations, it doesn’t really seem to give each the depth and attention it desires, so focused is the plot on showing the reader their next cool thing (and attendant crisis). I’d have been happier to have taken half the situations in the text, explored those more deeply, and presented the remaining plot threads in another book entirely. Still, I certainly can’t complain that nothing happens. The characters are a bit problematic. On the one hand, the protagonist is carrying around guilt, pressure to live up to a sibling, and a few other flaws – on the other, these don’t really present themselves in the narrative as well as they might; the reader is given a view into these motivations, but they don’t seem to help drive actions. On the other, the supporting cast suffer from being driven by the plot – in some instances, the emotions they feel seem to be forced, in service to the narrative rather than growing organically within it; the romance threads in particular are interesting in the plethora of character paths they leave open, but the rapidity of their growth is startling. There’s also the occasional problem of characters being forced to be idiots for purposes of the plot, and the emotions and logic of the supporting characters, in particular, seem to turn on their head at the convenience of the plot. It’s a shame, because the actual characters are quite interesting – they just need more time to develop, more space given to them, and some structure given to their actions, to make the characters and the plot act in symbiosis. Overall then, this is a solid debut, and a good start to a series. The seams creak a bit, especially around the characters, and in the multiplicity of plotlines, but there are some interesting ideas, and a broad and fascinating universe available to counterbalance this; right now, this is a decent read – I’m hopeful that as further books become available, they’ll pare down the amount of plot, and give the characters more room to breathe. That said, right now, it makes for a perfectly good popcorn read – it just has potential to develop into a lot more, and it would be good to see that potential realised. 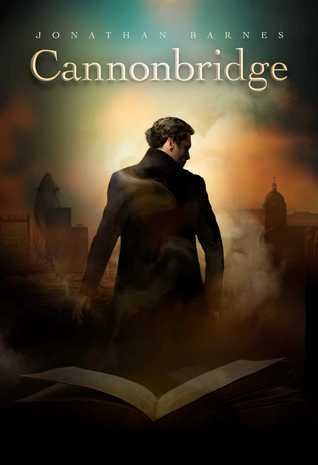 Cannonbridge starts with an unusual premise – that there is a writer, Matthew Cannonbridge, the greatest author of the Victorian age. The narrative breaks into two strands – the first, following Cannonbridge and his exploits through the Victorian period, and the second, a modern day piece centred on a lecturer of literature, who becomes convinced that Matthew Cannonbridge never actually existed. The Cannonbridge sections are written in a sort of faux-gothic style, which actually works very well, given the time period and the subject. It may be my imagination suggesting that the prose changed slightly to match the tone of the various authors Cannonbridge meets during his travels, but it wouldn’t surprise me either – this is a text very aware of itself. The prose, of these sections feels almost liquid, and makes for a very satisfying read. The actual events of the story are a bit…vague. Cannonbridge surfaces in times and places, seemingly near to other literary characters, and impacts on their lives – with variable results, though with a constant – that the man feels himself pursued, though by what isn’t entirely clear. The portrayal of Cannonbridge is largely done through action, rather than introspection – his supporting cast drawn well, but perhaps not with enough depth in some cases. The more modern sections are written as a bit of a potboiler thriller, following the unlikely hero of Doctor Toby Judd, an expert in Cannonbridge literature who comes to suspect that Cannonbridge is actually an elaborate literary hoax, and notices that other people who think this way appear to be dying rather precipitously. From there, the narrative carries a fair bit of action, and these portions are perhaps more obviously a page-turner than those set in Victorian England. Curiously though, the action is laced with periods of introspection, especially in the earlier segments from Judd – and these are quite whimsical, lyrical, and, as things progress, a bit depressing – presumably as intended. Again, the supporting cast is decent enough, though at times a bit convenient, and with motivations not fully explored. The two threads culminate together at the close of the book, with results which, frankly, were rather unexpected – a change in tone and direction. Still, it was all quite plausible, and interesting enough – but not as effective, I think, as the rest of the text. The close had surprise, but not impact, and seemed determined to stack reveals on top of each other, perhaps to the detriment of the book as a whole. Overall then, a pleasant read, with some interesting ideas, and a solid, occasionally exceptional narrative, with a conclusion which may delight or disgust in equal measure. Should have a review of Jonathan Barnes literary-fantasy, Cannonbridge, up tomorrow. It's dark, the prose is wonderfully gothic in some places, and the plot has a nice, swift pace to it. Definitely been worth the read. The Water Knife carries several of Bacigalupi’s signatures. Firstly, it’s talking about the human reaction to a global environmental problem – in this case, the impact of a shifting climate, and the decline in available water, on the southern United States. And secondly, it’s a masterclass in lyrical but punchy prose. The plot switches viewpoints between a reporter in the shattered remnants of Phoenix, the city now slowly dying from lack of water, a ‘Water Knife’ – an agent working for one of the tycoons now controlling the water trade across the United States – and a young woman, resident in Phoenix, struggling with desperation and efforts to escape. The author presents each character with care; each has a different narrative voice, and their decisions and actions all seem to grow organically from their interactions and world views. I won’t get into their motivations, and growth over the course of the text, for fear of spoilers – but it does happen. Each of the characters takes the reader on a journey through their portion of the narrative, and they (and quite probably the reader) aren’t unchanged by it. Another of the author’s strengths has always been world building, and setting a specific mood. His desiccated Arizona is paved with shattered dreams, each step, each moment, driven by the lack or luxury of drinking water. His depiction of Texans, driven into Arizona and unable to go further, their persecution and hopelessness, their implacable drive to make something better despite that hopelessness – all evoke Steinbeck’s Okies, and with a similar level of skill. The discussions of gangs of travellers using ‘Coyotes’ in an effort to get across the border into a state with an unrestricted water supply are appalling and, one suspects, a not unsuccessful allegory for situations around the US border today. The plot itself starts at a slow boil, dropping the reader into this world, familiarising them with the state of affairs, pushing out an action set-piece which emphasises some of the changes….and then, a little later in the narrative, the pace picks up further – by the end of the text, it’s a no-holds-barred free-for-all, which I absolutely, positively couldn’t stop reading. There’s a few flaws – some of the later action sequences aren’t as tight or suspenseful as those earlier in the text, and require a somewhat larger suspension of disbelief, and there’s the odd coincidence which serves the narrative, but requires a bit of a stretch to get behind. Overall, however, this is a very good book. It has excitement, adventure, and really wild things – but it also unashamedly asks the reader to consider larger issues, and doesn’t talk down to them whilst they do so. As such, thoroughly recommended. 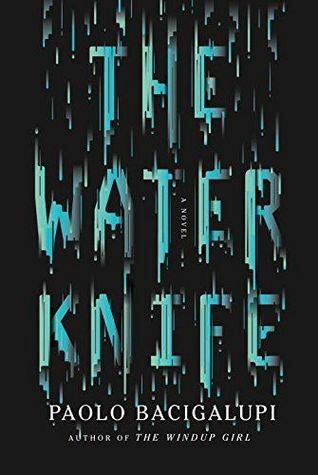 There will be a review of Paolo Bacigalupi's marvellous sci-fi-eco-thriller , "The Water Knife" up in the morning, In summary, it's really, really good. Bacigalupi pulled out the stops on this one. Well worth picking up. 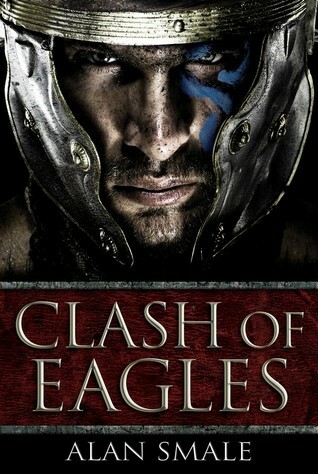 Clash of Eagles is a brilliant debut novel from Alan Smale, set in an alternate history where the Roman Empire never fell. It follows the Praetor of a Roman legion, sent across the vast depths of the “Mare Atlanticus” , following rumours of a new land to the west – and further rumours of gold. It’s an interesting conceit, and Smale has obviously done his homework. The officers and legionnaires are presented with a straightforward accuracy which suggests a great deal of research. There’s a lot of grit, grime, and a more than usual amount of blood – but it’s all wrapped in a wrapper of authenticity, which makes it believable, rather than gratuitous. There’s a few nice touches which provide a little bit of gilding around the muck – the inclusion of the odd bit of Latin swearing, for example. The legion eventually marches a few hundred miles, blowing through various unfortunate indigenous groups, before running into a culture that is very different to anything they’ve seen before. I won’t spoil the rest, but the exploration of the way in which Roman culture could or would interact with an indigenous North American group is at the heart of the text alongside the authenticity mentioned above. That interaction is very well done, largely through the person of the legion commander, Marcus, and his growing relationships with different members of the ‘mound builder’ people he finds himself amongst. Smale draws his characters well, if sparingly, and we’re given enough insight into their lives to feel for them, to understand their struggle. Marcus is particularly well done, as the central voice of the novel. It would have been nice to have had a little more depth, I think, especially for some of the central female characters, but there’s enough to drive the narrative along. On that note, it’s worth saying that rather a lot does happen – enough to keep me rapidly turning the pages. I wouldn’t say there’s a bloody battle on every page, but where there is, they’re grinding, bloody affairs, which ask no quarter of the reader, and make sure that you have a stake in the result – as with the cultural work above, it feels like this has all been well researched, and because of that, it’s a very exciting read. Overall, this is an absolutely storming work of alternative history. It pulls no punches, and each of those punches has, it appears been made to feel authentic. If you’re a fan of Romans in general, alternative history, want to see a man’s journey to understanding another culture, or just like epic battles, this is the book for you.